Had you been wondering if I did any cooking anymore? Well I have to admit, I’ve been a bit slack, I do still cook, I just been sticking to staples and not really bothering to take pictures and remember recipes. 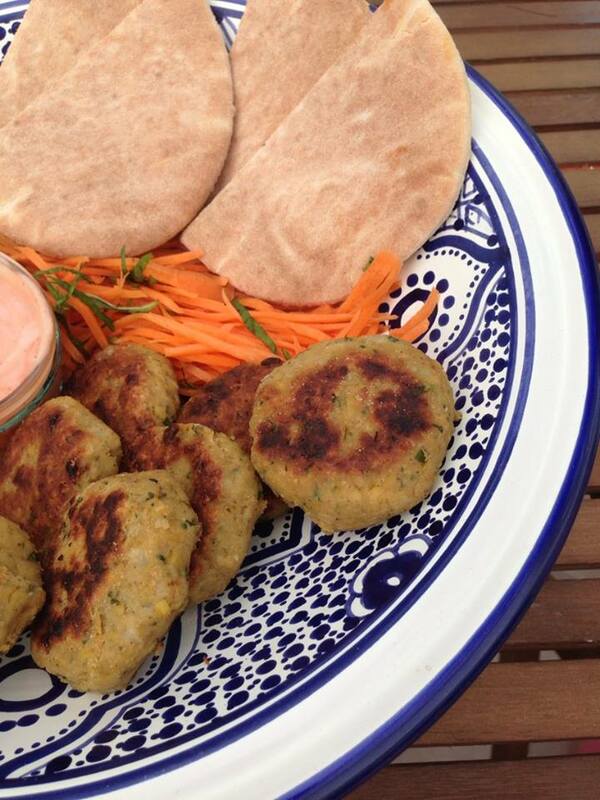 But here we have a simple little falafel recipe, perfect for summer days as part of a mezze or stuffed in a pitta. First soften the onions and garlic, I do this in a microwave because I find it easy but gently frying in a pan has the same results, you just want them soft and translucent. Then add all the ingredients bar the flour to a food processor. Blitz, you may need to scrape down any stray chickpeas or you might want to keep it chunky. Then depending on the wetness of the mixture I add two to three tablespoons of flour, now my plan was to have chickpea flour (gram/besan) but mine was out of date so I substituted gf plain flour, if you’re not coeliac then plain regular flour would work too. You want a thick but not too wet mixture that you can easily manipulate, see picture for clarity there, it’s awful hard to describe! Once you’ve got the right consistency, scoop out walnut size blobs if you want to emulate mine, but frankly any old size will work, you could make big fat burgers or round footballs or cut them into star shapes should you desire but flat patties was what I was after. Then chill the patties for a while (time constraints permitting, I’m sure they would be fine fried straight away should you need to). Shallow fry for about 3/4 minutes each side on a medium heat. Then serve hot stuffed into a pitta with chilli sauce and yoghurt. You can freeze these and heat up in the oven at a later date should you need to, I made too many for me and my little dinner guest so I’ve stashed the remainder away for a mid-week dinner. Ok, so that was the first recipe for a while. It felt good, what do you think?